Build & Inspire is a blog and podcast, mostly focused on business and technology, created to inspire people to build things they’re passionate about. We live in the most amazing times for technology, business, marketing, and beyond (marketers can target people like never before, entrepreneurs can get a business up in hours, and so on), so today is the time to start creating something. The Build & Inspire Blog has articles about technology and business – covering everything from sales and marketing to entrepreneurship. 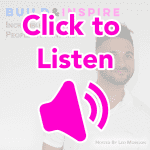 The Build & Inspire Podcast is a popular, interview-style business podcast where amazing people in technology and business are invited to share their work so they can inspire others to build and create the things they’re passionate about. Build & Inspire also offers social media and digital marketing services, as well as technology and sales training support to the world’s largest brands and agencies. Our team has worked with Oreo, The Estee Lauder Companies, Subway, 360i, Havas, and many other amazing brands. Let’s build amazing things together! The Build & Inspire Podcast is Live! Build & Inspire is a blog and podcast, mostly focused on business and technology, created to inspire people to build things they're passionate about.